I need help with my 2006 Base PT Cruiser. It has been below zero for 3 days in a row. The first couple of days, my car had a hard time starting. Now on the 3rd day, it just clicks. I have tried to jump it but and the starter is turning over, however, it will not start. While trying to jump it, there was a smell of gas, but I have a 1/2 tank. I am thinking possibly a fuel pump? 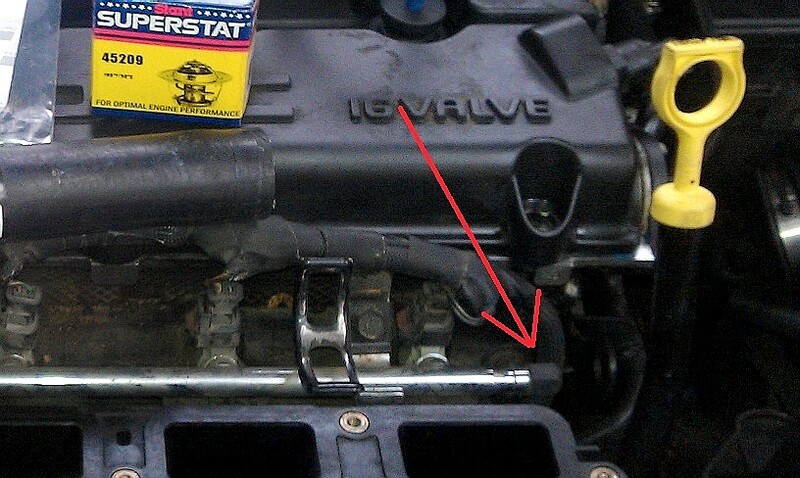 I am trying to locate the fuel line and the fuel gauge test port to see if it is the fuel pump, but I can not find a picture online to where it is located and I cant find it looking under the hood myself. Also, would this be happening because its too cold and should I wait it out until it is above zero? I am no mechanic by any means but would appreciate anyone's help/advice/anything. Once I took the jumper cables off the battery, it just clicks again when I try to start it. Thanks for reading and helping! Buy some starting fluid and give a shot in the air intake. Your battery is low if starter only clicks. New battery for sure, peace ( piece ? ) of mind will follow . Here's the schrader valve on the fuel rail under the black cap. But you need to try a fully charged battery first. randyincctx and talexander like this. I am thinking possibly a fuel pump? I am trying to locate the fuel line and the fuel gauge test port to see if it is the fuel pump, but I can not find a picture online to where it is located and I cant find it looking under the hood myself.! Once I took the jumper cables off the battery, it just clicks again when I try to start it. Thanks for reading and helping! That could mean you still have a battery problem,in addition to fuel....Check the date on the battery,and have it load tesed to be sure of the CCA(cold cranking amps). Here's the schrader valve on the fuel rail under the black cap. I am trying to locate the fuel line and the fuel gauge test port to see if it is the fuel pump, but I can not find a picture online to where it is located and I cant find it looking under the hood myself. Handy and Randy, the last of the schrader valves were on the NA 2004 PTs. No PT after that time came OEM with a schrader valve. His is a 2006, so no schrader valve. rob342 and talexander like this. Last edited by wwpptc; 06 Dec 2013 at 07:54 pm. Handy, the last of the schrader valves were on the NA 2004 PTs. No PT after that time came OEM with a schrader valve. His is a 2006, so no schrader valve. No schrader valve after 2004? What's the world coming to! Thanks for your help, I tried that out but no go. I will be getting a battery tomorrow and try that. Thanks again! Awesome thanks so much! Found it, thanks again!